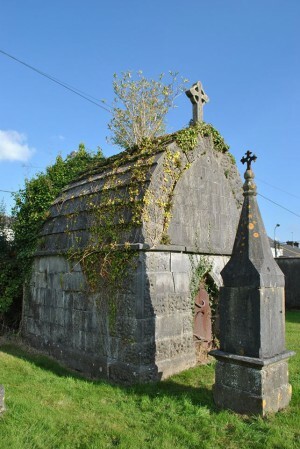 The Miller vault in St. Brigid’s Graveyard Portumna, Co. Galway is one of the many interesting architectural features to be seen on a walk around the town. With its vermiculated decoration it is quite unique in the town according to Christy Cunniffe, Galway County Council Field Monument Advisor. Today we ask ourselves who were the Millers who are commemorated here and where did they live — because there are no longer any Millers in the town? Well, look no more: the recently digitally-released Folklore Commission stories for the Portumna area tell the origin of the Miller family in the town. A beautiful romantic story… or legend! Around 1880, Portumna was the scene of a marriage between a Mary Coen of humble means and an English millionaire named Miller. 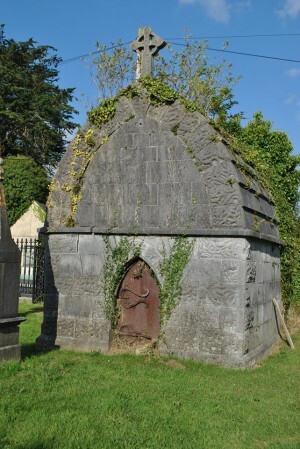 This is the story of the Miller Vault in the old St. Brigid’s Graveyard as related by John Mulcahy, ex RIC man and aged 56 as part of the 1937-39 Folklore Commission Collection.